What made you choose to set the book during the 1600s? It’s a fascinating time. It’s about 200 years after the introduction of the printing press to Europe, so the impact of printing and mass media was really taking effect. The Protestant Reformation had taken hold in some countries and the CounterReformation was in full swing in others, causing religious and political upheaval all over the place. In England, the Civil Wars threatened to tear the country apart. On the other hand, some of the greatest minds in history were writing and thinking, Europeans felt like they had discovered all these amazing new lands all over the globe, and more people than ever before could read, write and debate the issues of the day. If Isabella was the first character you came up with, who was second? Master de Aquila was the next character who came to my mind – I read a great deal about the printers of the time, and some of their stories were quite extraordinary. Among them were many who fled the Inquisition or had been expelled from Spain and Portugal, and found safety in other cities in Europe where they remade their lives and also made incredible contributions to the world’s knowledge with maps and books and new ways to print. Isabella is definitely not your typical girl from that period, was it important to you to tell the story from such a strong female perspective? It was. I wanted to write a book about a young woman who didn’t have to be rescued all the time, but on the other hand, her powers, if I can use that term, are intellectual. If she’s going to rescue anyone, she assumes it’ll be through her ideas and the power of her arguments – although, as we see, that’s not really how it works out for her in the end. There were, though, many very well-educated and brilliant young women living at the time, and their stories are not as well known as their male counterparts, unless of course they happened to be Queen of England or Scotland or Denmark. There are some sensational stories of women who defended their castles during the Civil Wars in England or the Fronde in France. Real warrior women, who after the wars went back to their normal lives (note to self: must get around to them one day). There were many women like Signora Contarini who worked for a living – women were poets, painters, printers, intellectuals, as well as those working on farms and businesses and homes. But their stories are not told very often: they slip between the cracks of history. 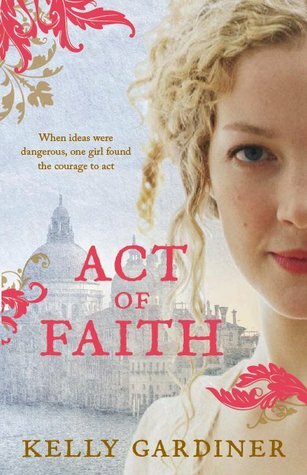 I heard a rumour that there would be a sequel to Act of Faith – is that true? If so, what can you tell us about it? True rumour! The working title is The Sultan’s Eyes and I can tell you this much: Isabella, Signora Contarini, Al-Qasim and Willem are living in Venice but are forced to flee when Fra Clement is appointed the new head of the city’s Inquisition. They travel to Istanbul , the capital of the Ottoman Empire, which at that time was ruled by a seven-year old Sultan and his grandmother. It was called the Sultanate of Women, and again it’s a fascinating period in history, with an awful lot of intrigue and dangerous politics swirling around. Isabella walks right into the middle of it. The Sultan’s Eyes will be out in 2013. I live in a former potters’ colony by a river and I use their old gallery as my office. It’s a mudbrick building with a wood fire and thousands of books and my chooks tapping on the window – it’s heaven. That said, I can write anywhere – on the train, in a library, in cafes. I’m not fussy. I wrote most of my first book in my lunch breaks in a noodle shop in Auckland. What’s currently on your To Be Read pile? My To Be Read pile is now officially too big to actually be read in the near future. I’m studying at present too, so my recreational reading time is sadly limited. I read a lot of history and biography, and not so much fiction. But the pile (it takes up a whole armchair now, so it’s starting to feel a bit oppressive) includes Kate Atkinson’s When Will there Be Good News?, The White Castle by Orhan Pamuk, Carlos Ruiz Zafon’s The Shadow of the Wind, and Ursula Dubosarsky’s The Red Shoe. There’s another pile of books about Istanbul that I have to read before I can start drafting The Sultan’s Eyes, so I’d better get reading. What a terrible problem to have.